Gordon Hayward was crying on the back of a golf cart behind the stadium. They were about to drive him to a private CBS studio for a post game interview. I was holding a steady close up of the kid’s face: red, tired, and beaten. He had just lost the championship. The Butler Bulldogs had just lost the NCAA Men’s Basketball Championship by one basket. The Bulldog’s had fought an intense back-and-forth game. Almost a Cinderella story, the Bulldogs were a small local school, small program budget, and relatively under recruited compared to other big schools. Despite most predictions, they made it to the top. With a scrappy defense, and a young baby faced player named Hayward, the team fought every game to get to the finals. Going up against Duke, nearly every paper in the country compared the game to David and Goliath. Courtside shooting Butler warm up. I had to opportunity to cover the games as a photojournalist for CBN. I headed to Indianapolis for the semifinals and finals. Four teams were left. The city was breathing basketball for six days. Signs were up everywhere, blue and orange adorned nearly every doorway. Fans from each of the four teams still left in the tournament wandered the streets randomly breaking into school chants and cheers. As cliche as it sounds, the air was electric. Downtown Indianapolis. Apparently this is where all the roads lead. Everyone loves cheering for an underdog, and Duke was definitely not one. A powerhouse team, with an arguably legendary coach, and a lineup of seven McDonald’s All Americans: mixed together created one of the best teams in the nation. Goliath? If Goliath had 4.0 high school GPA maybe. These players were big, smart, and very capable. But this article isn’t about the game. You can watch ESPN or look for game wrap ups online for that. I wanted to write about an interview we had with Steve Johnson (#51), a redshirt Junior on Duke’s bench. I went to high school with Steve and his older brother Luke. It would be a stretch calling him a friend, but Steve was a friend of my brothers, and our families knew each other well. Steve walked onto the Duke team, not really expecting to make it past the first few cuts. He was recruited to the track team for high jump, but Coach K overrode that when he saw how high Steve could jump. But here’s the catch: Steve didn’t play. He was redshirted his sophomore year and saw action in only a few games over the course of his four years on the basketball team. We interviewed him briefly in the locker room before the championship game he wouldn’t play in. 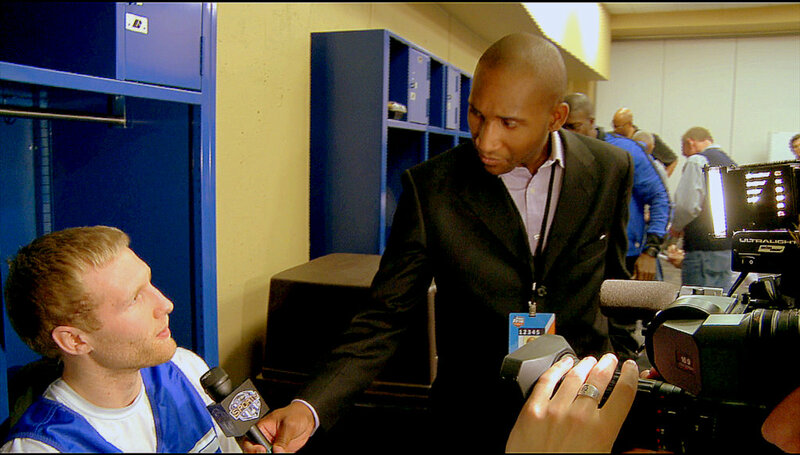 Every media group that covered sports was crowded in the locker room, fighting for an interview with Scheyer, Smith or Singler. Steve sat in the corner, in his warm ups, listening to his iPod. No one was talking to him. I hadn’t seen him in a few years, but he still recognized me. We chatted for a brief second, and then my producer started asking him some questions: mainly about being a Christian, and how that gets lived out on the team. He had some very wise and mature things to say. He talked about being in a supportive role, and how humbling that is. He also talked about the attitude of servanthood written in the Bible’s New Testament scriptures. Talking with Steve Johnson after the first win over WVU. “I won’t make the game winning basket, I won’t be in the spotlight,” he told us. But he said he was fine with that. He said he had accepted his supportive role, a role of sacrificing himself and pushing others in practice. While he won’t make any game winning shots, he still trains and pushes himself just as hard as every other player. He understands the team mentality that the world often loses. We glorify the champions, the game winners, the faces at the top. And we want that. We want to be carried out of the stadium. We want to sign autographs, we want to be the best. There’s nothing wrong with setting a goal. And there’s nothing wrong with working hard and attempting to achieve that. But (and it doesn’t matter if you’re a Christian or not) embracing a servant-like attitude is something even more difficult. Sacrificing self in pursuit of team, that’s true humility. And while ESPN won’t feature any interviews on you (but your hometown newspaper might), your team will know the sacrifice. To be honest, the interview we did with Steve didn’t even make it on our show. We didn’t use any of it. I feel bad about it to be honest. We only aired interviews with the guys that played. I don’t really get a lot of views on my blog (50-60 a day normally). But I feel like I owe it to Steve to write about his humility and sacrifice. At the very least, what he said to us in that busy Duke locker room affected me more than what any other player said during my time in Indianapolis. And let’s not forget that Duke won. So congratulations to Steve and all the other Blue Devils. 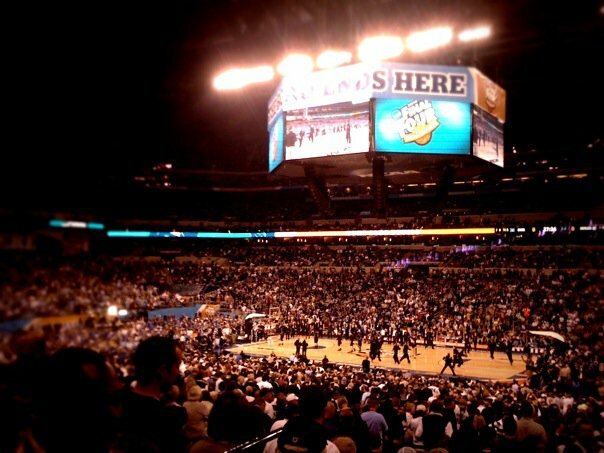 Inside Lucas Oil during the championship. Additional write up on Steve in Goduke.com. 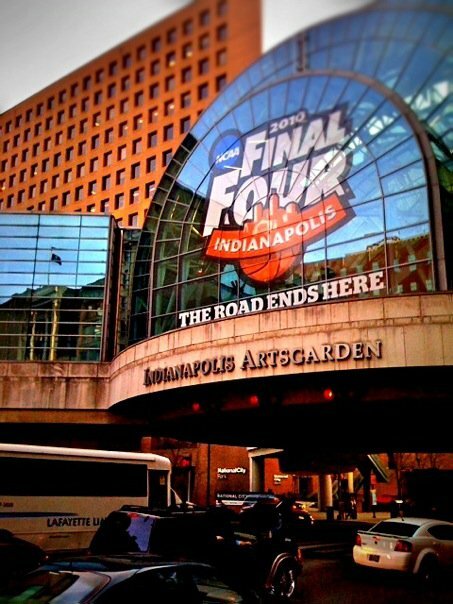 This entry was posted in behind a camera, CBN, Entertainment, National News, Opinion, Personal and tagged #51, 700 Club, all roads lead to indianapolis, Basketball, behind a camera, behindacamera, bench player, Butler, CBN, CBN Sports, CBN Sports Final Four, Christian, Christian Sports, Duke, Final Four, Hayward, humility, Indiana, indiana final four, indianapolis, NCAA, Nored Butler Christian, redshirt, ryan johnson, sacrifice, sean brown, Steve Johnson by Ryan Johnson. Bookmark the permalink. Bless you and Bless Steve for allowing all of us to see that God can use us sitting on the bench or in the middle of the action. God will honor both you as a journalist and Steve as a humble player on a winning team. It isin’t the team. . . it is who we are and in whom we believe. Hat’s off to both of you. Thanks Grandma! I appreciate the compliments. It was such a blast to be there and film. Thanks for the blessing too.